My usual walk home from work is across Loring Park, past the fountain and the lake and over the bridge. Once over the bridge the pathway splits in two to allow for a small circle of grass, which most people walk across anyway. On Monday I noticed the following, in this order: two people lying on the circle, a bicycle, also lying on the grass, a park policeman, his car, and the fact that he was standing over the two men holding a gun to them. The grass circle is quite small, maybe 20 feet across, so I was going to have to get quite near to this situation (and fresh in my mind was the fact that there had been a disturbance in North Minneapolis over the weekend after a boy was hit by a ricocheting bullet when a cop had shot an attack dog, which had been set on him during a raid of a drug house). I tried to stay quite calm – those guys were not moving anywhere. I’m guessing that there was some drug dealing going on, so they may have been somewhat less than alert anyway. So I strolled past, trying not to be obviously looking at what was happening. Pretty soon another police car showed up and I assume cuffed and removed the men. That’s probably the nearest I have knowingly been to a loaded and wielded gun. As you know, I got a new car about 4 months ago – opting for a Saturn VUE after a fair bit of test driving and comparison shopping. We’ve been really pleased with the car and the service, and it seems that once again Saturn have been ranked highest in a sales satisfaction survey. What’s particularly interesting is that they have come above such top brands as Lexus, Porsche, Mercedes-Benz, Jaguar, Cadillac and Lincoln. In fact you have to go to 17th in the list to find a non-luxury brand (Ford). Emma and I were in a bookstore a couple of nights ago leafing through baby names books. I picked up a more general pregnancy book called something like “Your Pregnancy Week By Week” and checked out what they had to say. The thing I was shocked by was that each week had a Dad Tip box – all very well except that the tips were so lightweight they were almost a complete waste of time. Things like “Make sure your wife is comfortable at night”, or “Your wife is going through many hormonal changes, so expect some mood swings”. Is this 1950? 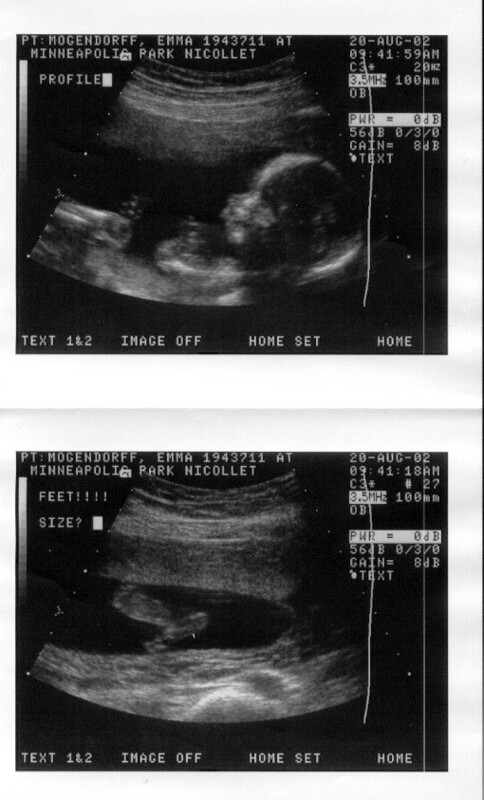 In the Week 20 (where we are now) chapter there was information on the ultrasound, which is generally done around this time. The Dad Tip was “Seeing the ultrasound is an big deal, so if you’ll only be able to make one doctor visit, this is probably the most important”. If that’s the kind of low expectation of involement that men are reading about, is it any wonder that they end up so uninvolved in the whole adventure? Yesterday we went down to the Immigration and Naturalization Service (INS) offices in Bloomington, next to the Mall of America, to be interviewed for the final stage of Emma’s green card. We were slightly stressed about it, not knowing quite what to expect, but in the end it was very easy and quick – the case officer didn’t really seem to know why we even had an interview. Mine had been approved a few weeks ago, but I hadn’t gotten around to getting the final stamp so I did that yesterday also. We’ll be getting the actual cards (which aren’t even green) in a few months but until then we each have a stamp and some handwriting in our passports, which doesn’t look very official but means that as permanent residents we don’t have to sign anything to leave or enter the country, we’re no longer linked to my job, so if anything goes wrong we don’t have to leave and can get unemployment benefits, I don’t have to stay in the same type of job, and have the same work status as any American. So a lot more security and stability. It’s taken over three years to get this far, and I’m very happy it’s finally come through. Hoping to get away from work earlyish this afternoon, about 4pm. It’s been a really busy week but good, made very good progress on our rather intense but exciting project. Emma and I decided that what with busy work, house, baby and all kinds of other things we really need a break, so we’ve booked a couple of nights in a B&B in south western Wisconsin. I can’t wait, it’s a very nice part of the country along the Mississippi and there are lots of cute little towns with craft shops and restaurants. I expect to be thoroughly soothed by the time we get home. You are currently browsing the andrew.mogendorff.com blog archives for August, 2002.